Volunteers help load sandbags at Silver Lake Resort this week. The owners of the Silver Lake Resort got a taste of their own hospitality this week, when about a hundred locals, employees, customers and campers pitched in to help load sandbags onto the banks of Alger Creek after days of hot weather caused this winter’s record snowpack to melt and overflow Sierra waterways. Jones said that The June Lake Fire Department and Lee Vining Fire Department also pitched in, although Lee Vining Creek was also flooding this week, said Jones. 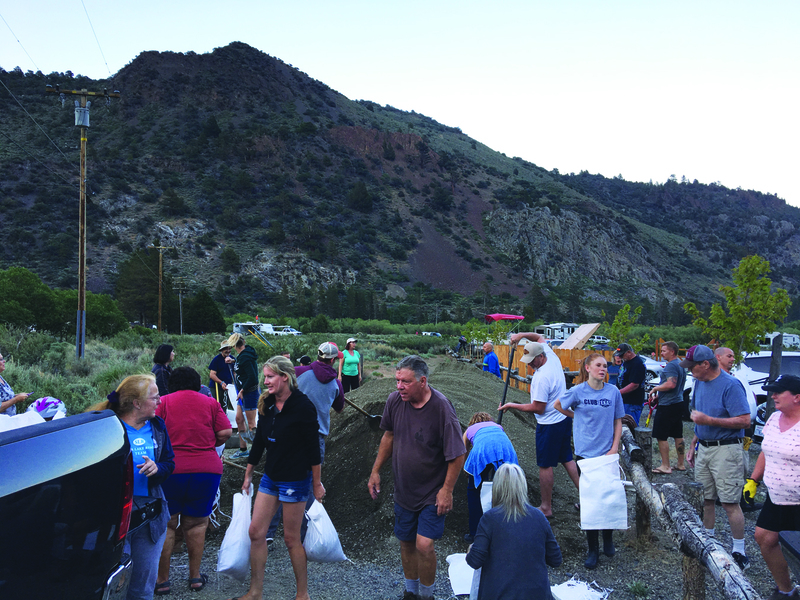 [Monday] night we were in dire need of more sandbags, and a lot of them had gone down to Lee Vining Creek, because that road was washing away,” said Jones. Lee Vining Creek Campground was evacuated due to the high water, she said. Although the rising water levels have caused some stress for local business owners, Silver Lake has turned into a paddleboarder’s paradise, with areas that are usually marsh becoming completely submerged.